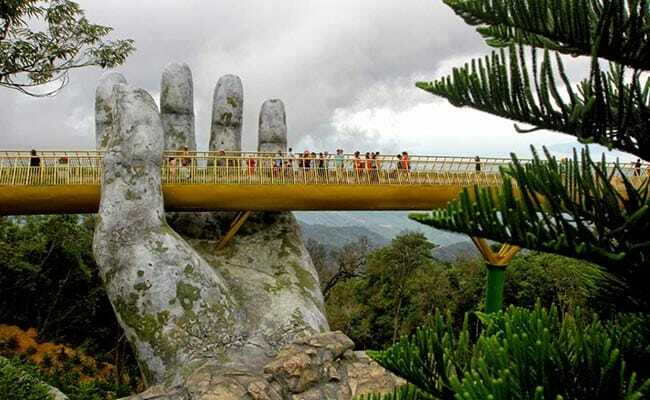 Built over 1000 metres from the ground, the new Golden Bridge is nestled between the central mountains of Vietnam, and is held up by two giant hands on either side of the bridge, giving it the popular title – “God’s Hands”. Called ‘Cau Vang’ in Vietnamese, the Golden Bridge near Danang City has become a major tourist attraction since its opening in June, with many tourists taking an interest in walking across the elevated bridge and taking pictures to share their experience. The bridge was designed by Vietnamese architect Vu Viet Anh, who stated that the intention of the bridge was to give people a great view of the cliff tops and faces of the Ba Na mountains. Surprised by the popularity that the bridge has gained from social media, Anh said that the point of bridge’s appearance makes it look like “God’s hands pulled a strip of gold from the mountains, creating a walkway in the sky, among the foggy and fairy-like lands of Ba Na mountain”. The Ba Na mountain was a popular spot for the French colonists during the 1920s and some of their decayed homes can be seen from the bridge or the cable car on the way to the amusement in Danang City – which features a wax museum and a faux French cathedral.